With 130 cast, crew, and orchestra players, The Phantom of the Opera, the longest-running show on Broadway, is back in Manila. The world’s most popular musical makes its long-awaited return starting Feb. 20 at The Theatre at Solaire in Parañaque City. “The show has not aged. The show does not feel dated. It does not feel dated in the writing and staging. It does not feel dated in its stagecraft. I think that’s why primarily people still want to see this production,” Arthur Masella, the new touring production’s associate director, told the press during a recent rehearsal visit. “I think every show would eventually take the opportunity to recreate the production. 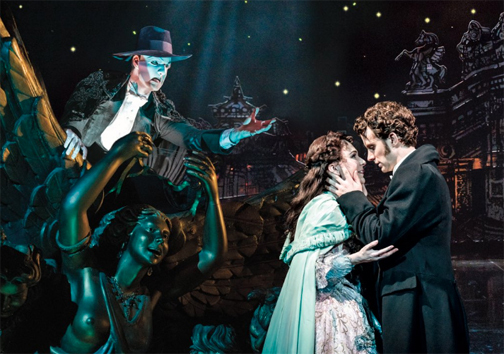 There has been another production of The Phantom of the Opera in recent years and it’s doing well on tour and liked by many audiences. What I feel to be like happening in the last year or two is that once again there’s a demand for the original production of Phantom. People have been wanting to see it again,” he added. Seen in over 37 countries, 172 cities and 16 languages, the world's most popular musical, 'The Phantom of the Opera,' makes a long-awaited return to Manila. True enough, tickets to the show’s original run are already sold out. Originally set to run from Feb. 20 to March 17, the Manila restaging of the musical is now extended to March 31. “The Phantom of the Opera put Filipino theatre fans on a spell in its Philippine debut almost seven years ago, and we’re thrilled to be able to bring back the legendary musical for more Filipinos to enjoy,” said Oscar Enrico A. Reyes, Jr., Senior Vice President and Head of Consumer Market Development for PLDT and Smart, which presents “the world’s most popular musical’s” long-awaited return to Manila. The Phantom of the Opera is presented in Manila by Concertus Manila and produced by Lunchbox Theatrical Productions. The musical adds to a string of world-class musicals that PLDT and Smart helped bring to Filipino audiences, including Cats, Chicago, Wicked, and Les Miserables. Debate 2019: The GMA Senatorial Face-Off True to its commitment to delivering the most credible coverage of the upcoming May polls, GMA News and Public Affairs mounts Debate 2019: The GMA Senatorial Face-Off airing tonight. The debate will give voters a chance to get to know the candidates running for 12 coveted seats in the Philippine Senate. Debate 2019: The GMA Senatorial Face-Off will tackle various topics ranging from the candidate’s track record to his/her stand on various national and international issues. Questions to test each candidate’s credibility and competence are also included. In the second round, candidates with opposing views shall debate on key national issues. In this round, senatorial hopefuls will argue for or against a particular issue and will be paired with another candidate who has an opposing view. Should the Philippines legalize divorce? Should term limits be removed? These are just some of the questions that are up for debate. Debate 2019: The GMA Senatorial Face-Off aims to help citizens make an informed choice in the upcoming elections. And tonight, voters will get the opportunity to know the senatorial aspirants better and fi nd out where each candidate stands on the most pressing issues. Catch Debate 2019: The GMA Senatorial Face-Off later at 9:50 p.m. on GMA.